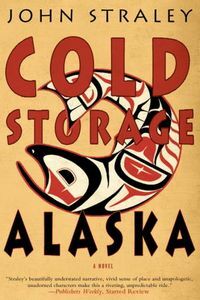 Cold Storage, Alaska by John Straley, a Mysterious Review. Review: Miles McCahon, a former Army Ranger now a Physician's Assistant — the only medical professional within sixty flying miles of his remote Alaskan fishing village of Cold Storage — is not looking forward to being reunited with his brother Clive "The Milkman", who has recently been released from prison after serving seven years of a ten year sentence for dealing drugs and is intent on returning to their hometown, in Cold Storage, Alaska, a stand-alone crime novel by John Straley. Clive just wants to go straight and open up a bar in Cold Storage, which requires two things: cash and a church. The cash shouldn't be a problem: he has his illicit drug dealing proceeds hidden away in Seattle and intends to tap them before returning to Alaska. As for the church — the town requires an equal number of churches as bars, and Cold Storage currently has three of each — he intends to hold services on Sundays in the bar to cover that requirement. But he doesn't anticipate two problems cropping up: the first being his old crime partner, who wants the cash for himself; and the second, the local State Trooper, who is intent on driving Clive out of town just as quickly as possible. The characters and setting are the hallmarks of this crime novel, which has more comic elements than criminal ones. The relationship between the brothers is a cool, if also civil one. Miles fears that Clive will bring instability into his life (which he does) while Clive worries about Miles being too much of a spoil-sport (which he is). The post-industrial fishing village of Cold Storage is clearly in decline, and yet its 150 often strange and eccentric residents couldn't imagine living anywhere else. Fast-reading and entertaining, Cold Storage, Alaska depicts life in an otherwise quiet small town where the most unexpected can — and usually does — happen. Special thanks to guest reviewer Betty of The Betz Review for contributing her review of Cold Storage, Alaska. Acknowledgment: Soho Press provided a copy of Cold Storage, Alaska for this review.